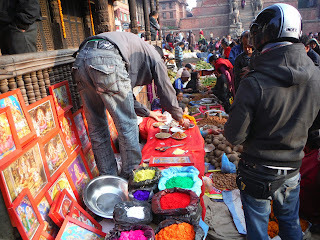 Kathmandu, like any city is full of shops and markets. There are some larger, more expensive shops in the city centre, similar to in Europe, with window manikins clothed in their wares. 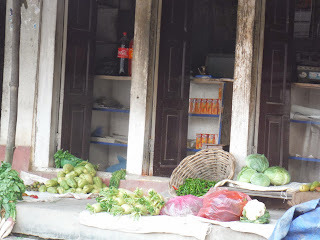 Of course as in any city in the world, you also find the ubiquitous supermarkets, and Kathmandu has a few large ones and many small ones on street corners. However the small traders are to be seen everywhere. They need to be supported or they will just disappear, as they have almost done in Britain. In parts of the city the pavements of the narrow streets are filled with traders displaying their wares. 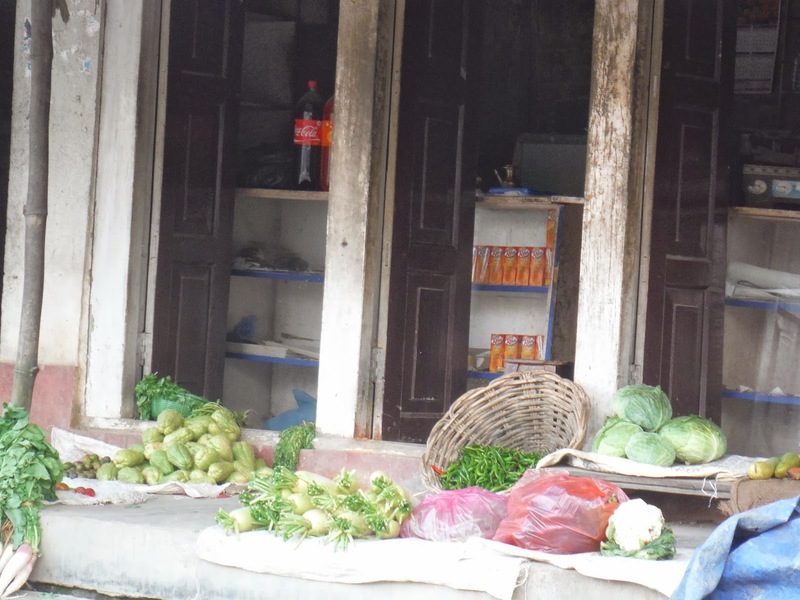 The shops behind are so small and dark that the traders need to spill out into the open air. 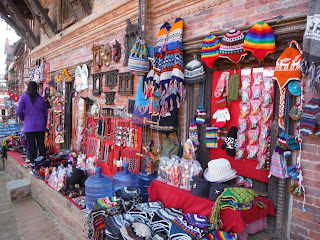 Items for purchase are hung on every available surface, and spread out on the pavement outside the tiny shop, filling the narrow alleys with multicoloured wares. The salesmen will often stand outside hoping to encourage passersby to stop and browse. 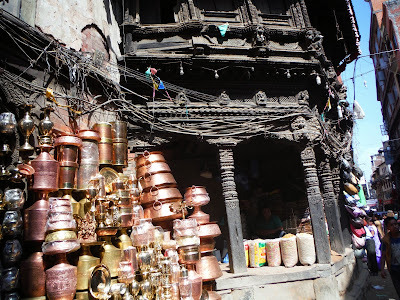 Brass pots shining in an alley in Thamel, Kathmandu. Sacks of rice in front of the next door shop. Notice the carved pillars. Green vegetables for sale outside this tiny shop. 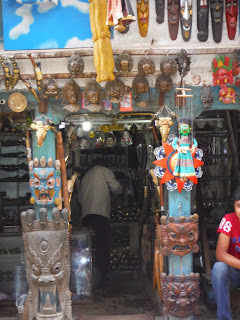 Tibetan masks and souvenirs catch the eye. Some sales men have no shop at all, but carry their goods for sale in large baskets, mounted on their bicycles, both front and back, or suspended from a pole across their shoulders. 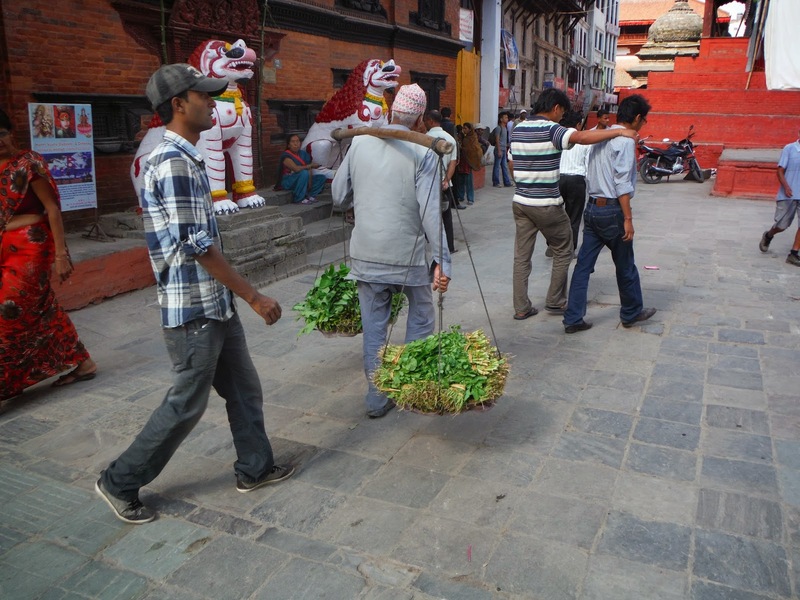 These men are frequently selling fruit or vegetables, one or two types only, and will tour the residential streets and alleys, shouting to encourage people to buy their wares. We have bought potatoes, apples, oranges and cucumber from these bicycle salesmen in the lane outside our accommodation. Cucumbers and garlic for sale! This man has green vegetables in his baskets. By the sides of busy streets and main thoroughfares men and women will frequently be found, sitting on the ground with goods for sale spread out on tarpaulins, displayed on boxes or in baskets. 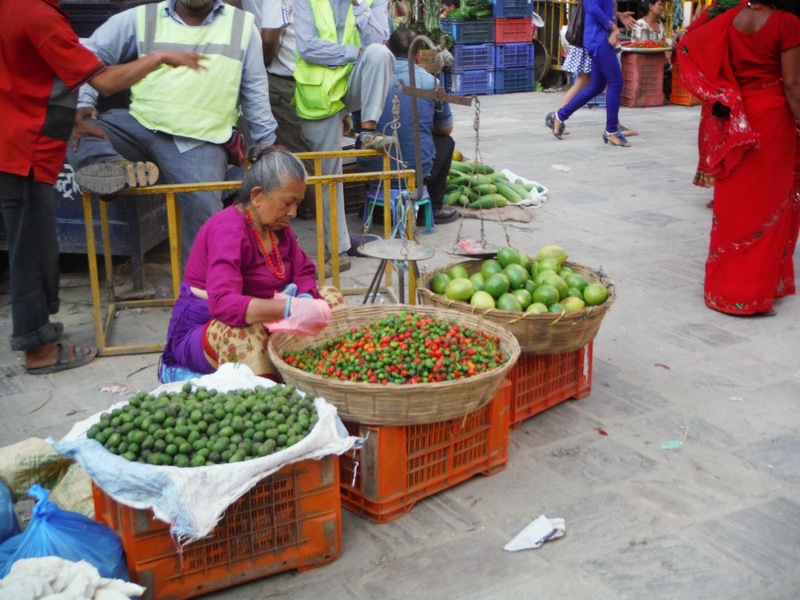 In Kathmandu Mall, in the city centre, beside where the majority of buses drop their passengers, the pavements are crammed full of these traders, selling clothes, stationary and books, small toys and a multitude of other things. 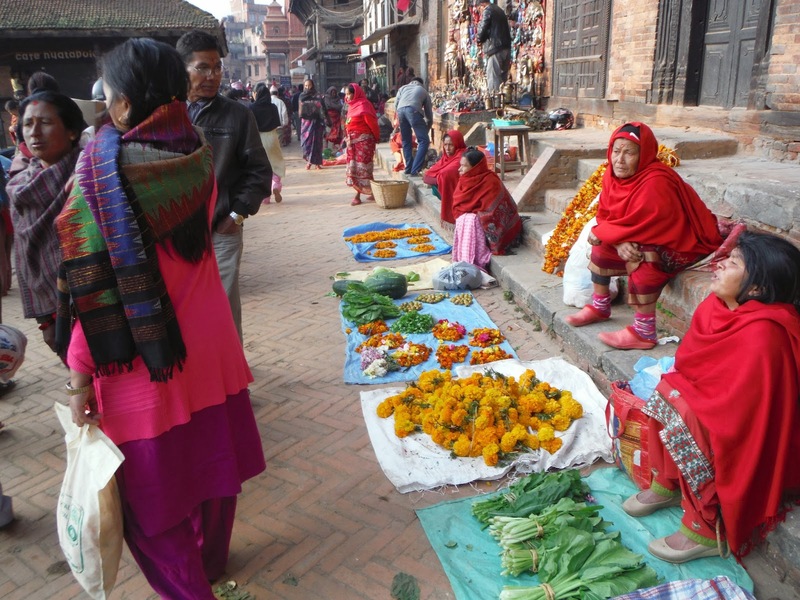 However more common to see outside the city centre are the traders selling fruit and vegetables. Chillies, limes and grapefruit in these baskets. Finally, the smallest scale of sales person are those who carry their wares with them. In tourist areas many are to be found selling souvenirs; Nepali flutes, jewellery, small bags and purses, and, strangely, miniature chess sets. 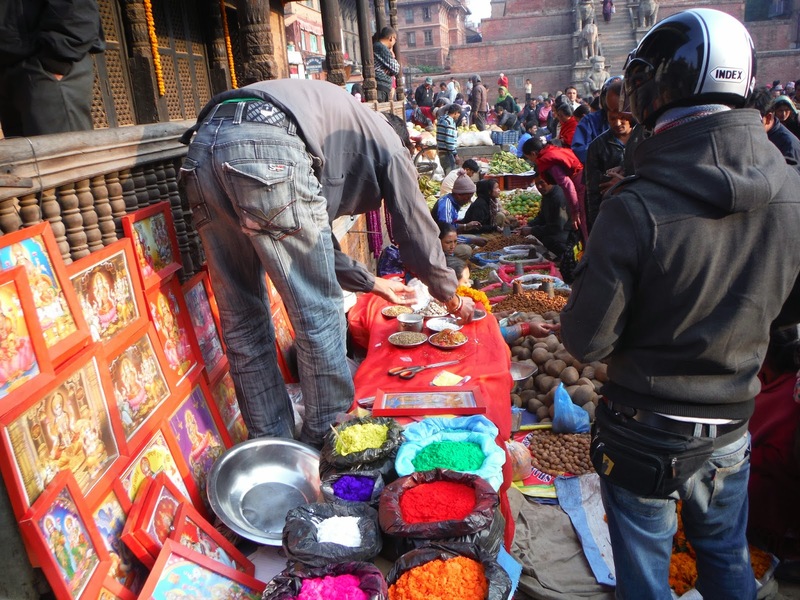 These people will wander the tourist hot spots, accosting anyone who looks like a 'bideshi' in the hope of making a quick sale, often at a vastly inflated price. The range of shops and traders found in Kathmandu makes shopping quite a different experience from the weekly journey to the supermarket in Britain.